ta Mananni is a lovely three bedroom holiday villa with own private swimming pool located at the outskirts of Qala. Just 2 km away from from Mgarr Ferry harbour and within walking distance to restaurants, mini markets, butcher, etc. It is an ideal place to unwind and relax for both families and couples all year round. Lovely for country walks in winter and just within ten minutes driving to all beaches in Gozo. Eating out is typical mediterranean with lots of pasta, fresh fish, meats and local vegetables. As such Ta Mananni is an excellent holidayhome for romantic couples and families all year round and during school holidays too. 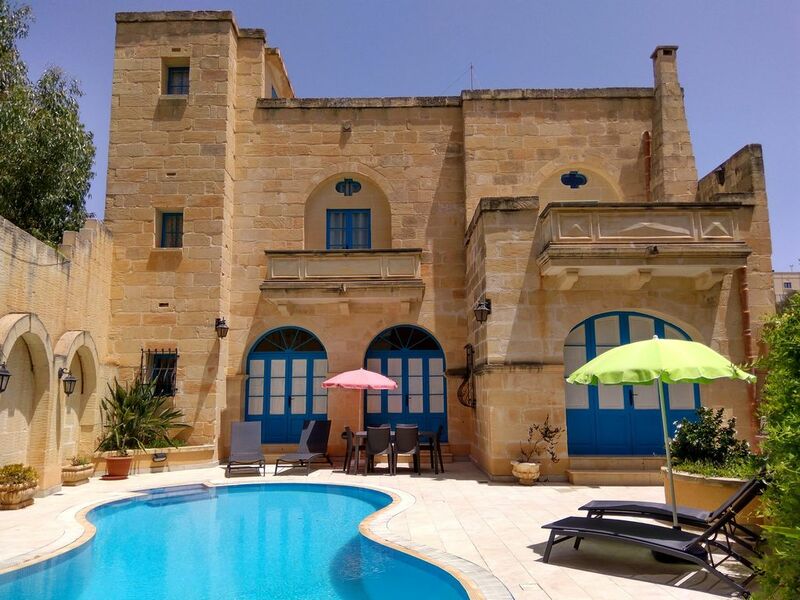 Since Gozo is an excellent diving location, ta Mananni is an equally well placed property. ta Mananni has got three bedrooms all with ensuite shower/bathrooms and the fourth bathroom is a jacuzzi type. Kitchen is fully equipped and located next to dining area which sits six adults. This is open plan type with lounge area consisting of two sofas, one a two seater and a three seater plus a wing chair. Cable tv and dvd is lcoated next to a fire place for the cooler winter months. This overlooks the swimming pool with is a pleasant figure of eight overflow type. Pool deck is large enough for sun loungers, garden furniture for al fresco dining, barbeque and outdoor shower. Free wi-fi as regards broadband internent available throughout the villa. Born and Bred in Malta and Gozo! Ex air traffic controller as a profession, lately company director of an import and manufacturing company. My wife Marianne and myself manage two beautiful holiday properties one of which is Ta Mananni. We converted ta Mananni way back in 1998 when we bought the land with a couple of rooms. Managed to convert to a delightful holiday villa withing two years from scratch. We recycled all the limestone which was available on site and which one can admire in today's Ta Mananni villa! The beautiful swimming pool is part and parcel of the villa, one does not exist without the other! As from March 2017 all 3 bedrooms will have airconditioning on a pay per use coin operated system. Fireplace located in sitting room area. Lovely for the cooler winter months, normally, December, January and February. wifi is free to all our guests and is available all around the villa with no restrictions. Please bring your own towels for the pool and beach, thank you. Kitchen comprises of fridge/freezer, hob, oven and sink. Fully equipped with coffee maker, microwave, toaster and all amenities one can expect! Dining area is located next to the kitchen, dining table seats six adults and is located between kitchen and open plan sitting room. Cable package with a lot of channels. Nearest Gold course is Marsa which is located on the Island of Malta 38 km away. We had a wonderful stay. The villa is beautiful. Very spacious and very clean. As well as the enclosed courtyard garden and pool area, there are two terraces. The location is very convenient, just 2 mins drive from the ferry, and great places to eat and drink within a few minutes walk. Had a great relaxing stay early October 2018. The Villa is clean and well furbished. Gozo is a lovely interesting Island and well set up for a nice relaxing holiday. Good area for sight seeing and the view 100m from the Villa across the islands is outstanding. Enjoyed our stay for the week immensely and would be prepared to go back again. The Villa is within good walking distance of the town centre with bars and a couple of small shops. No negative comments on the Villa or surroundings. The property is very well equipped with good outdoor space and a lovely pool (much needed in the 30-pus degree temperatures we enjoyed). Location in Qala is out of the way and quiet and yet there is access to nice little restaurants,a couple of bars, mini-markets and a pharmacy. Perfect for us. It was a real pleasure having you as our guests at the villa. Thank you very much for taking such good care of the property. It would be really nice to have you and your family back, anytime. Thank you. Fabulous villa for a relaxing holiday. Villa is very well equipped especially the kitchen. The area is quiet and a short walk from supermarkets, the bus stop and restaurants. The pool is excellent and just what's needed in such hot weather. The wifi and tv service are very good. We enjoyed visiting various places in Gozo and visited Malta and the Blue Lagoon. We hired a boat and went round Comino which we thoroughly enjoyed. We would recommend this accommodation to others. I am so glad Elaine that you enjoyed the villa so much. It was a pleasure communicating from initial contact, and also during your stay. Thank you for taking such great care of the villa itself. It would be more than our pleasure to have you back as our guests in the very near future. A very quite Farmhouse and very welcoming.The farmhouse was very cleaned. We enjoyed every second of our stay. Raymond was always very helpfull. Thanks alot and .cu next year. It is always a real pleasure to have Adrian and family as our guests year after year. Thank you for your continous custom. See you next year! Well-equipped kitchen, plenty of space, peaceful location. Airport transfers worked well. From first contact, guests were very good to communicate with. We are very glad that they had an enjoyable stay. It would be our pleasure to have them back in the near future. Thank you. Gozo is an open air museum with Ggantija temples in Xaghra being the most visited in the whole of the Maltese archipelago. Ramla l Hamra beach is just a ten minute drive away, whilst hondoq ir Rummien is Qala's own pebbly beach. From April to end September every town and village has got its own patron saint and celebrations are well organised especially around the week end. Sub acqua diving is also well catered for by numerous PADI affiliated schools. Marsalforn and Xlendi are the coastal resorts where most restaurants and eateries are found. Eating out is very well catered with lots of fresh fish, pasta, fresh meats and local fruit and vegetables. Local wines and olive oils are not to be missed. To make life at an easier pace from July 2011 new bus service in all of Malta and Gozo make car hire not totally essential. Please visit www.publictransport.com.mt for more information and timetables. change over time is very flexible. A booking deposit of 25% is requested to confirm booking. Direct Bank transfer is preferred but Paypal payment is accepted at a 5% surcharge on each transaction.